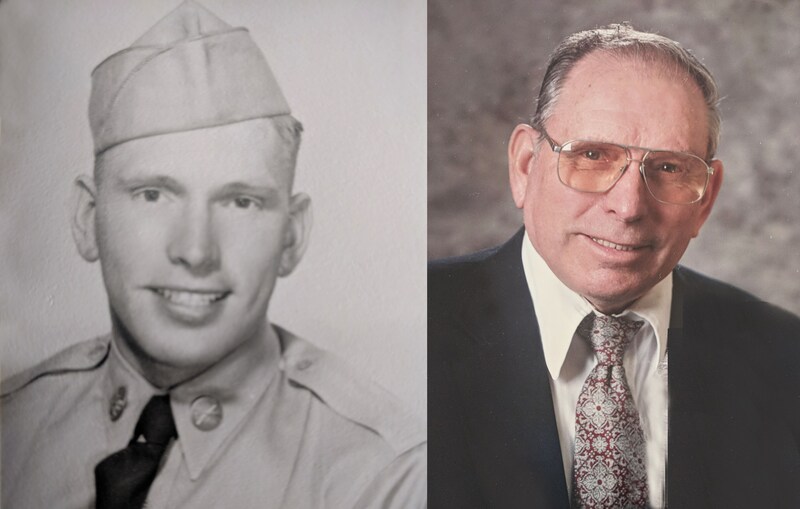 Our beloved brother, husband, father, grandfather, and great-grandfather, Vern William King, 89, passed peacefully from this life on April 3, 2019, in his home in Oakley, Utah. Born October 15, 1929, in Moore, Idaho, to William Wallace and Adella Marie Sorenson King, Vern was the second of five children. Two years later, the family moved to Rupert where Vern spent the rest of his growing-up years. Helping on his family farm, Vern learned to love work at a young age. This was a trait he would carry with him his whole life and one of his most-defining characteristics. Vern graduated from Rupert High School in 1947. He then attended Ricks College and Utah State Agricultural College. Vern served an honorable mission for the Church of Jesus Christ of Latter-day Saints in the Great Lakes Mission from 1949-51. Upon his return, Vern met his sweetheart, Alyce Bair, in Sunday School. Their first date was to a Gleaner’s dance and banquet, and a courtship ensued after that. During that time, Vern served his country in the United States Army. While stationed at Camp Pendleton, California, in the hospital recovering from a severe hand injury, he painstakingly used his left hand to pen a proposal of marriage to Alyce back in Idaho. They were sealed in the Idaho Falls Temple on March 25, 1953. Eight days later, Vern shipped out for Korea, and it was 11 months before they were reunited. They raised six children (five to adulthood): Robert (Renee) King of West Jordan, Utah; Ronda (Kent) Dalton of Tucson, Arizona; Mark (Kitty) King of Oakley, Utah; Marla (Mike) McLeod of Kennesaw, Georgia; and Beverly Kinsey of Price, Utah. Vern was preceded in death by his daughter Bernice, who passed away as a fun-loving, sweet 8-year-old. She and Vern shared a special bond, and the family is comforted knowing they had a joyous reunion. Vern spent much of his life farming his homestead in Idaho. He also worked as a postal worker for 18 years. Upon retirement, he and Alyce served a mission to Nauvoo, Illinois from 1991-92. They relocated to Oakley, Utah in February 2007 to be closer to family. Vern’s quiet, gentle nature was a magnet for those of all ages; everyone was drawn to him, especially children. One of his greatest joys was his posterity: 27 grandchildren and 59 great-grandchildren. He loved to attend his grandchildren’s sporting and other events, and he was no fair-weather fan! Rain or shine, you always knew grandpa would be there—with a handful of hard candy in his pocket. He and Alyce also enjoyed traveling, with Red Fish Lake being a family favorite. Vern was an active member of the Church of Jesus Christ of Latter-day Saints all his life. He served in various positions, including 14 consecutive years as ward clerk under three different bishops. He was a kind, loving, considerate husband and father who would gladly do anything for anyone. He never spoke an unkind word, and he was a great example of contentment, service, and unwavering faith. He will be greatly missed by all who knew him. The funeral will be held at 2 p.m. Friday, April 12, at The Church of Jesus Christ of Latter-day Saints, 1224 W. State Road 32, in Oakley, Utah, where friends and family may call from noon until 1:45 p.m.
A graveside service will be held at 1 p.m. Saturday, April 13, at the Rupert Cemetery, 450 N. Meridian, Rupert, Idaho, with military rites provided by the Mini-Cassia Veterans Group.